As Smackdown continues to look like WWE’s “wrestling” show, featuring longer matches and adding more depth to the feuds that are seen on Raw, it continues to grow into a more enjoyable show, this week stuck to the trend, although certain segments continue to bring it down. The show kicked off with another edition of Miz TV, which is becoming a regular opener for Smackdown as of late. The usually loud mouth host The Miz was especially quiet for this edition with Daniel Bryan and Kane doing most of the talking, advancing their storyline, with some input from Randy Orton. Daniel Bryan and Kane did an excellent job with lengthy speech that could have caused some other talent to trip up. Randy Orton seems to enjoying himself again, as his role is allowing him to play less smiling face and more of a tweener character as he continued to wind up Daniel Bryan. With Daniel Bryan exploding in anger at Kane, accusing him of rather tagging with a different competitor, causing Kane to leave the ring. This was a well-played moment from both men, and could have easily come across as a cheesy moment, without the intensity employed by both men. As The Miz teased the end of Team Hell No, Smackdown Senior Adviser Teddy Long came out, determined once again to prove his fetish for a good old fashioned TAG TEAM MATCH, placing Daniel Bryan and Randy Orton together to take on Tag Team Champions The Shield in the main event. Further building up to this contest, there was a backstage segment between Orton and Bryan. With Orton informing Bryan of Kane having to go to the trainer’s room after a match with Ryback. Bryan showed little concern for Kane, it will be interesting to see if WWE try’s to turn Bryan in to the heel in the inevitable rivalry, and it will be extremely difficult with Bryan uber-over at the moment. With Orton revealing that he didn’t like Bryan, the conflict between the two would build nicely heading into the tag team contest. It’s becoming repetitive to have to keep writing about how good The Shield’s matches are, but the fact is they just are that good and when you through in Daniel Bryan who is also on fire at the moment and reinvigorated Randy Orton to mix you’ve got a great combination. With Bryan refusing to tag in Orton near the start of the match, the tension between the two continued to build throughout. With The Shield keeping control of Bryan, until “The Submission Specialist” finally accepted Orton’s helped and The Viper exploded off the hot tag. The Shield soon got control of Orton but it wasn’t long before another hot tag, and this time to man who has turned the hot tag into an art form as of late, Daniel Bryan. This time threw in a beautiful belly to back suplex which turned Seth Rollins inside out. The ending came when Bryan accidentally connected with Orton in the corner with a front kick, Rollins went for a roll up, only for Bryan to lock in the No Lock. This was too much for The Shield as United States Champion Dean Ambrose made the interference. With Bryan using The Shield’s own momentum to take out Rollins and Ambrose, it was Randy Orton who had the final say with an RKO to Bryan. This was one of the best ending’s to Smackdown for a while, as it felt like it would actually have some consequence and has left me eager to see how the storyline develops on Monday. Paul Heyman continues to not only talk up Curtis Axel’s victories over recent weeks but also to give Axel the time to talk himself. This time only a sort promo to tie into Axel’s victories over World Champions, this seems to be recycled from 2006 when MVP was going around saying similar things about his cheap victories over World Champions. Axel has begun to finish his promo with the word “Perfect” Axel will need to be careful not to play the same role his father did as similar situations, such as when Ted DiBiase played the exact same character as The Million Dollar complete with Million Dollar Championship and Virgil, it didn’t really work out. Paul Heyman joined Michael Cole and JBL on commentary, this was a good decision by WWE. It allowed Heyman to continue to talk up his client, as well as explain his motivations during the contest, although at times it seemed to be more about CM Punk that it did about Curtis Axel. Punk’s match with Jericho did need to get pushed, but it did take the focus somewhat off Axel at various points throughout the match. The match included dominant spells for both men, as it went back and forth throughout. There were some nice sequences included a dive between the rope to the outside from Jericho, who later surprisingly missed a Lionsault, before being hit with Axel’s Spinning Neckbreaker, only to kick out. 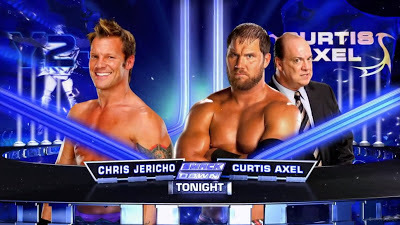 The ending sequence saw Axel escaped the Walls of Jericho to the outside, and with Heyman jumping on top the announce table, pointing to the tron and CM Punk’s music hitting, with Jericho confused, Axel crawled in the ring for the roll up victory. It was a nice ending, but Axel continues to look like an afterthought in Heyman’s stable, merely giving him something to when CM Punk and Brock Lesnar aren’t around, which is a shame considering his in ring ability. After the contest, Jericho beat on Axel eventually hitting him with a Code Breaker. This keeps Jericho looking strong heading in to his contest with Punk at Payback. Axel on the other hand is now undefeated in Six since joining Paul Heyman, and his cheap victories are helping him build into his heel role, however he could really do with some clean victories over some mid card talent on Raw and Smackdown to prove he is capable of hanging with the bigger names. He could also do with a new finisher since both the Perfect Plex and Spinning Neckbreaker have been kicked out of in recent weeks. Elsewhere, Alberto Del Rio was supposed to take on Heath Slater. However, with the other member of 3MB attacking Del Rio pre-match the match didn’t start. Del Rio was however easily able to fend off his attackers before placing Slater in the Cross Armbreaker, Slater quickly tapped out. McIntyre and Mahal however weren’t finished off and came back for more. This time however they were met by Ricardo Rodrigues who teamed with Del Rio to take them out of the ring, before heading to the top rope for a flying splash. It’s funny to think that Ricardo is probably more over with the fans as a face than Del Rio, but it’s because he plays a more sympathetic character and looks a lot more comfortable in the role. The segments was fun, but meaningless doing little for either party but it was what happened afterwards that was the real talking point. Dolph Ziggler appeared on the tron, marking his first real appearance on WWE TV in around a month, which is long time for a World Heavyweight Champion as WWE chooses to circumnavigate the 30 day defence rule once more. With Ziggler cutting a good short promo, before announcing that he’s cleared for competition and will be on the next Raw, it appear WWE can finally stop treading water with the rivalry, but with just a week until Payback it could be a push to develop anything resembling a meaningful rivalry. 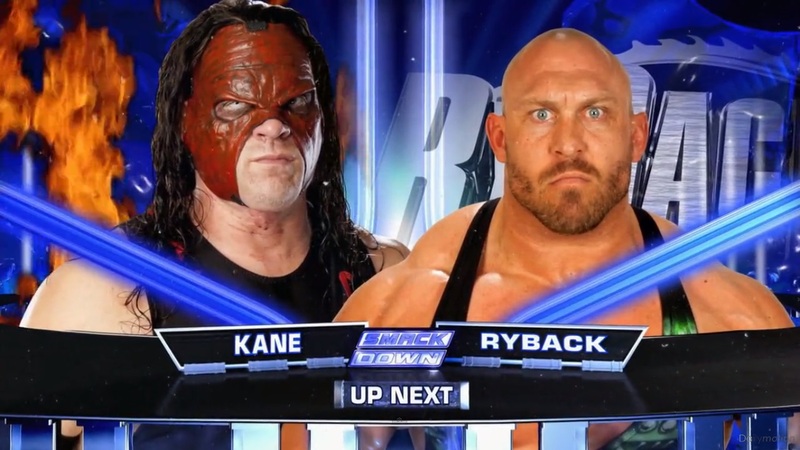 As mentioned earlier Kane was also in the action against Ryback. In a segment reminiscent to Ryback’s meeting with Daniel Bryan on Raw. 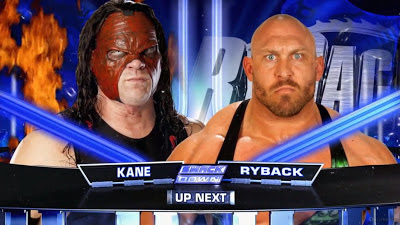 With Kane defending Bryan and asking Ryback if he could put him through a table, surprisingly however the match that followed was a regular singles match. Kane’s work on interviews and promos has been really impressive over recent weeks and his ability to switch between comedic and serious is something not a lot of WWE competitors possess. I was really surprised by this contest, as I expected something similar to Ryback’s match with Mark Henry at Wrestlemania. However Ryback and Kane put on a pretty good match, not a technical bout no, but it was back and forth, as well as both men landing some heavy hits which certainly added to the match. Unfortunately, it was cut short when Ryback pulled out the table and after some reversals by both parties, just about managed to powerbomb Kane through the table. Ryback has really benefit from his number of longer contest with the likes of Kofi Kingston and Daniel Bryan as of late and WWE has finally built him up into a realistic challenger for Cena’s title at Payback. I was really surprised by this contest, as I expected something similar to Ryback’s match with Mark Henry at Wrestlemania. However Ryback and Kane put on a pretty good match, not a technical bout no, but it was back and forth, as well as both men landing some heavy hits which certainly added to the match. Unfortunately, it was cut short when Ryback pulled out the table and after some reversals by both parties, just about managed to power bomb Kane through the table. Ryback has really benefit from his number of longer contest with the likes of Kofi Kingston and Daniel Bryan as of late and WWE has finally built him up into a realistic challenger for Cena’s title at Payback. There was also a quick match between Fandango and Zack Ryder. Ryder got in a surprising amount of offence, probably down to being in his hometown of Long Island, but it was always clear who was going to win. After Fandango reversed the Rough Ryder into a power bomb, he hit a diving leg drop from a ridiculous distance for the win. Fandango is currently trending in the right direction at the moment and with Vince McMahon apparently being high on him, it’s very possible that Fandango could win the Intercontinental Championship come Payback. Once again Smackdown produced an embarrassingly bad segment, with Damien Sandow and Sheamus. With Sandow introducing a Super computer and proceeding to play it at chess, it got proceeding worse from here. Sheamus came out saying he could beat the computer with one more, which was painfully obvious would be the Brogue Kick. After Sheamus smashed the computer, Sandow took him out, throwing him into a table. These two could have a pretty decent feud, this just isn’t the way to do it. There was also a random segment with Kaitlyn and Natalya. Kaitlyn revealed she would meet her secret admirer on Raw, with Natalya telling her to be careful. Kaitlyn appeared to turn heel, yelling at Natalya and accusing her of being jealous. This could have been a big moment in the story, if there had been any build up to it at all! 2. Curtis Axel is in desperate need of a finishing move. 3. WWE can finally get going with the Dolph Ziggler/Alberto Del Rio feud, with just a week til Payback!